The beach in question being a mud-hole. But that doesn’t matter to these young Killdeer, only a few days old. 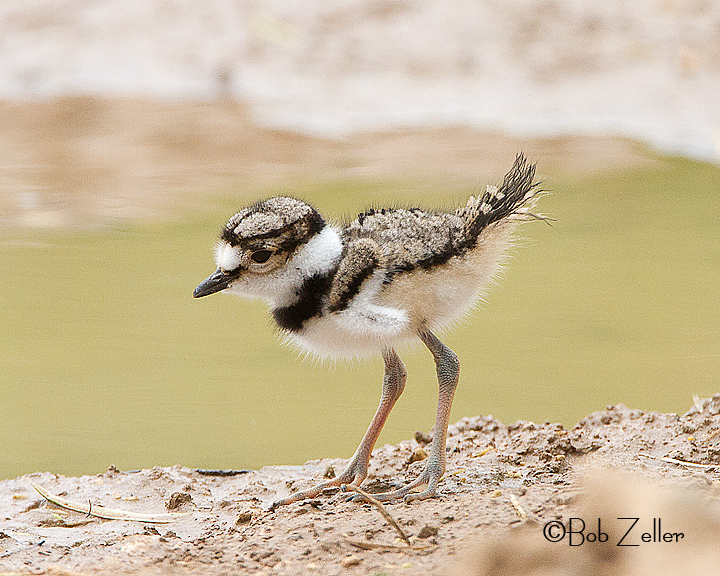 We had driven up to one of our favorite birding spots, when I noticed some baby Killdeer walking around the water. I pulled the car up behind a mesquite tree, but in position so I could shoot photos from the driver’s side window. There were four of the little ones, all walking along the side of the mud-hole. The adult mother was a few feet away in hovering mode. Off to our right, was the adult father, doing the broken wing act to draw us away from the children. 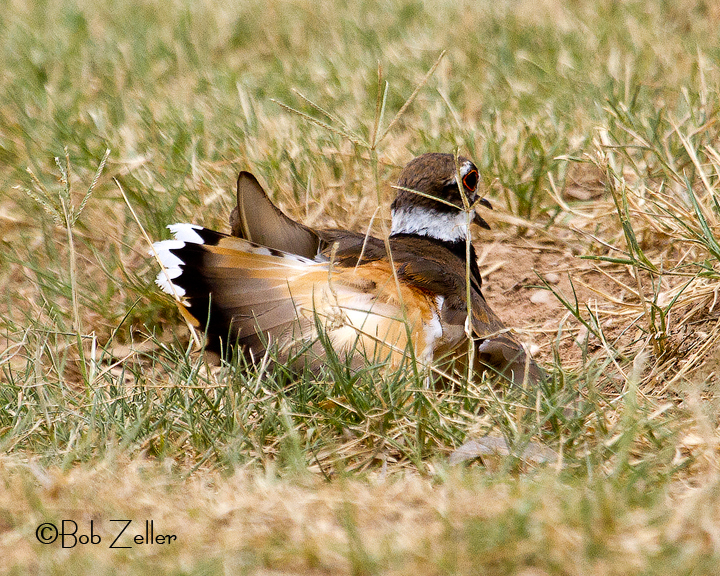 Adult Killdeer faking a broken wing, to draw us away from the chicks. 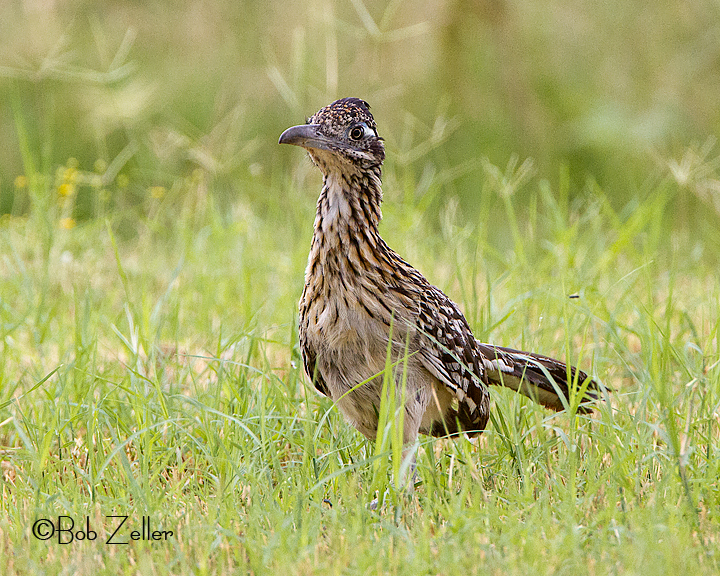 Nearby, a Greater Roadrunner was making plans of his own. He makes a run at the chicks, trying for a quickie lunch, but the two adult Killdeer give him a merry chase and sent him on his way. The mother is still wary and she draws her children close to give them protection. 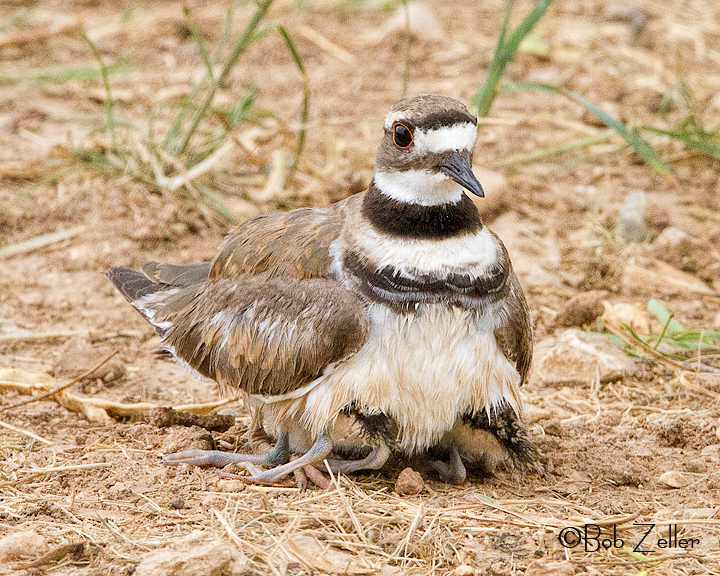 Adult Killdeer with her children. Soon all four chicks are completely covered by the adult. Adult Killdeer protecting her children. Soon after, the adults sensing that the danger no longer existed, released the children and they went back to play. I and Ann were thrilled to watch this display of family love and togetherness. We were reminded of some dear friends in Houston that have a similar family. There are four children there, too, and the parents are completely devoted to protecting and loving them. The only difference is, that the father may not fake the broken wing. But I am sure he would do whatever it takes. I hope you enjoyed this post and photos. Click on any of them to see some enlargements. This entry was posted in Birding and Photography and tagged Bird, birding, birds, blogging, bob zeller, Canon EOS 7D, Family, greater roadrunner, killdeer, Parenting, photography, texas, wildlife. Bookmark the permalink. ← Were Having a Heat Wave……. 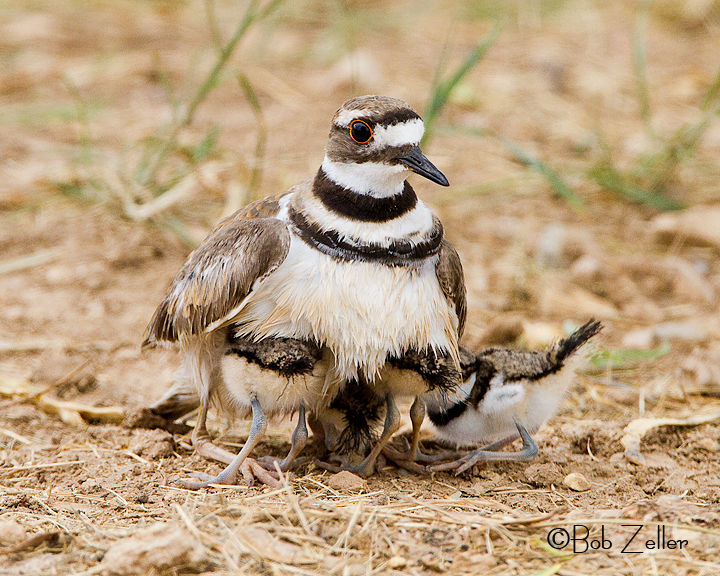 Loved this post Bob, the killdeer chicks are absolutely adorable, you captured some beautiful endearing photos. 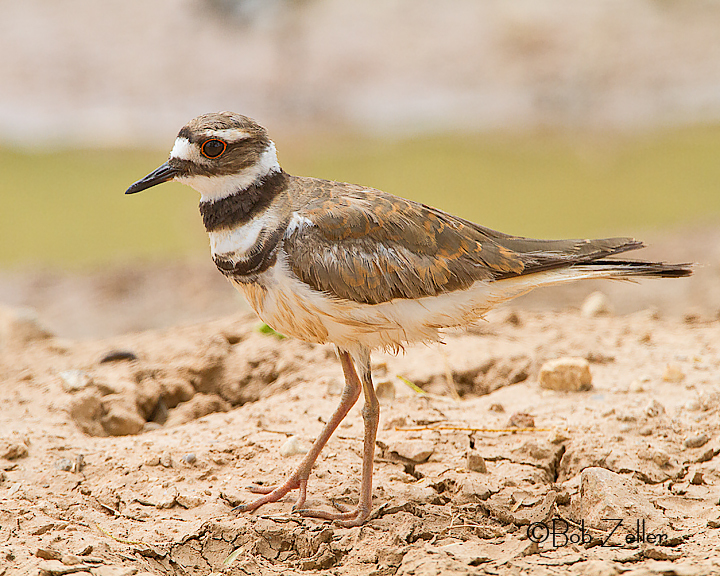 I’ve recently spotted a couple killdeer families alongside the road and around the marshy areas close to me, I need to go back to get some shots before their chicks grow up! Thank you very much, Donna. I hope you can get some of those shots, too. Superb, Bob! So glad you were there to witness this and get such great pictures. I had no idea Roadrunners were predators, I’ll have to learn more about them. In particular I love the shot of all the kids tucked under the hen, that is priceless. This is a super series of photos Bob. It must have been a pretty neat experience watching the parents protecting their young! Thanks, David. Yeah, it was pretty neat. I don’t get many chances like that. Very enjoyable series of photos and wonderful narrative. Your audience is quite appreciative. Thanks so much, David. I appreciate it. What an awesome set of shots! 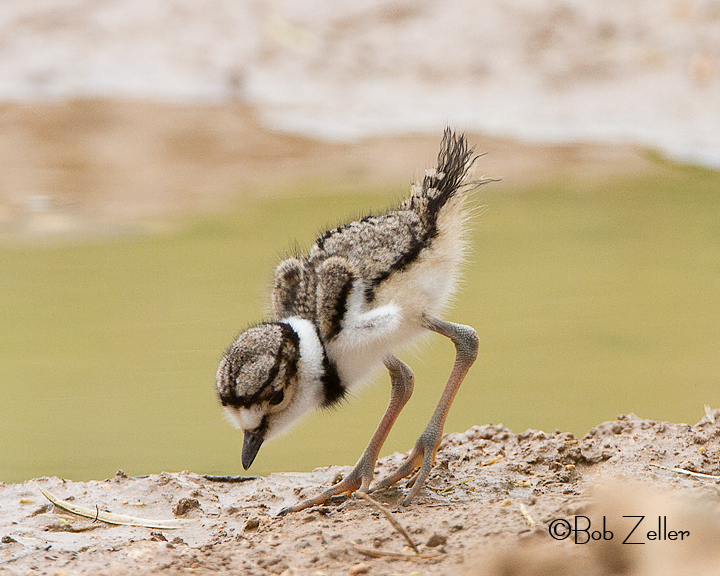 I have never seen baby killdeer before, what a treat! They are adorable. Love how you were able to record the entire encounter and how the momma gathered her chicks under her for protection! Thank you very much, MJ. Your commentary is so apt for these photos..good lesson for all…love the family..the photos are fabulous and the babies are too cute to describe. You and Ann were certainly blessed to watch these birds..Roadrunners are real oportunists…Thanks so much for sharing.. Thanks, Syl, for your kind comments. Awwwww…. those were great family portraits! Cute! Perfect shots of the little babies. I have yet to see baby kildeer. Love that roadrunner as well. Thanks, Mike. I appreciate your kind words. Light rain this morning and a bit cooler for a change. Thanks, Jo. These chicks were a few days old. When they first emerge from the egg, they are all big eyes and long legs. Thanks for sharing this experience with us Bob. Your stills and commentary are better than any video. Thanks, Jim, I appreciate your kind thoughts. You get all the luck with the juvie’s! Super cute little guys. Those roadrunners are the brutes of the bird world. They are ruthless and lethal to chicks. Good thing the parents were fully on guard. Thanks, Shannon. It was an amazing experience. Those adult Killdeer were taking no prisoners. They really went after that Roadrunner.